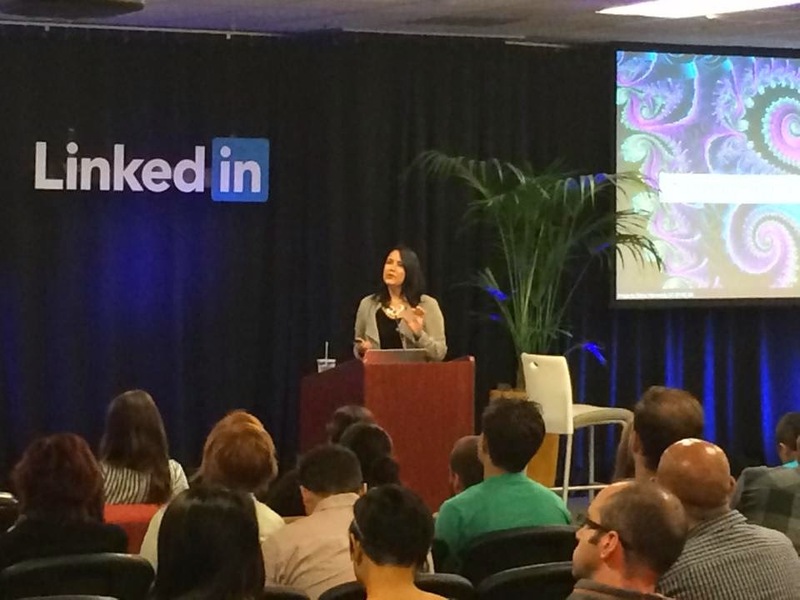 On Friday, I spent the day sharing and learning with the User Experience Design team at LinkedIn in Mountain View. It was an awesome day! I grew up in the Silicon Valley and spent years of my life before I went into education commuting the freeways throughout the valley. The drive in to the LinkedIn headquarters was a reminiscent one for me personally and also provided me with ample time to reflect on the increasing role that technology plays in formal education and the social landscape that continues to transform our lives, the very nature of informal learning, and the possibilities it holds for transforming education. Steve Johnson, LinkedIn's VP of User Experience Design (and a friend of mine from high school) invited me to join his team for the day and it started with my presentation, The Fractal Life: Harnessing Social for Authentic Agile Living. My presentation was very much a story about my own life as an educator and how, through my professional risk-taking -- inspired by two amazing parents and open heart surgery at age 34 -- and the intensive development, continuous nurturing, and on-going sustaining of my social networks I have been fortunate to discover my authentic passion and align it with career opportunities that make me look forward to every day. Living authentically has given me clarity that vulnerability is not only important to being happy, it is the essential element that individuals should leverage as an ongoing feedback loop in their life. Using vulnerability as a feedback loop reminds an individual every day of the need to take risks, the need to lay our souls bare to understand who we are really are, what we are good at, and what makes us entirely miserable. The outcomes are not successes or failures; they are simply experiences that we loop back inside and sort through to identify what we have discovered about our uniqueness. In this way, our feedback loop transforms our life into something like a fractal, always in motion, taking in fresh experiences, while learning from everything -- yet, always guided the same, consistent pattern, our commitment to vulnerability and risk-taking. After my presentation, I had an exciting day sharing my experiences in higher education with leaders from the UED team. I am unable to write about the details, due to a non-disclosure agreement I signed upon arrival. But on a more broad level, I can share that conversation simply made me wanting more. While I had opportunities to share many of the realities that educators face when it comes to making sweeping changes within our organizations, the need to make these changes is more clear than ever. LinkedIn has 300 million worldwide users and has extended the professional network experience into a virtual, global space. 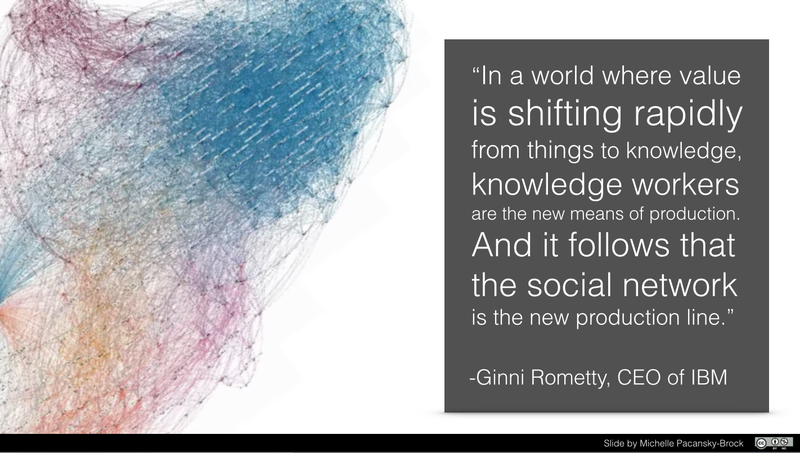 Fostering relationships has always been key to a successful career and as we prepare students for the future, ensuring they understand how to do so with social technologies is invaluable. A mindfully nourished LinkedIn network can be an invaluable resource for an individual seeking to make a career advancement or to a graduating high school student or community college student preparing to transfer to a university. Yet, how often is LinkedIn leveraged as a learning resource in college? How many college students are encouraged to connect with and/or follow subject matter experts on LinkedIn or research company pages? These are questions I'd love answers to! I'd love to work on an eBook that contains activities that leverage a tool like LinkedIn for learning. As more workplaces adopt the social business model and social technologies continue to become more integral to informal learning, shouldn't we be building more ways to improve dialogue between the private sector and education? Thanks for inviting me for the day, LinkedIn!